Special Olympian Jennifer Granger proudly displaying her hard-earned medal. 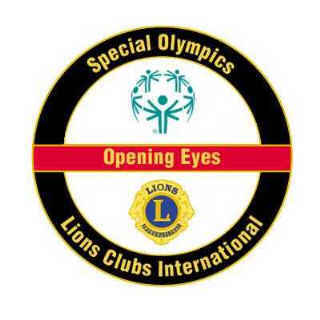 SPECIAL OLYMPICS - The Lawton Northeast Lions club sponsors a Special Olympian to compete in local and regional events every year. "LET ME WIN, BUT IF I CANNOT WIN, LET ME BE BRAVE IN MY ATTEMPT"
Special Olympians, coaches, volunteers, and their friends danced to the music from Perry Broadcasting's K98 JAMZ radio station, who conducted a live, 'on-site' radio broadcast during the 2006 Special Olympics. Special Olympian Jennifer Granger checks out the Oklahoma Lions Mobile Health Screening Unit. District 3-L Governor Al Sikora, Lions Willie Smith and Lynette Carter greeted her warmly. The Oklahoma Lions Mobile Health Screening Unit at the 2006 Great Plains Area Special Olympics. Special Olympian (and future Lion?) Jennifer Granger, surrounded by her friends, Lions Ed Rall, Adela Sandusky, Ron Brown and Wes "Big Buckaroo" Williams. 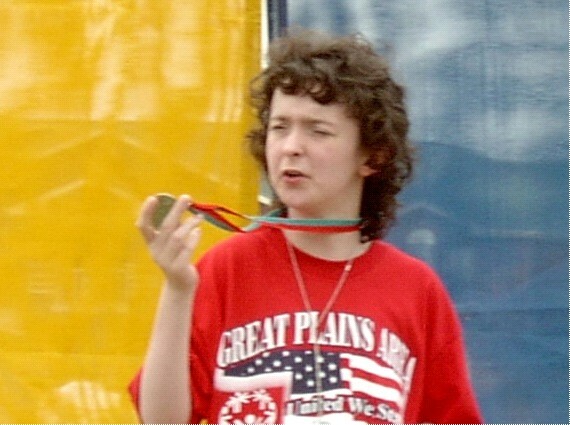 It was a chilly, yet sunny day on April 7th, 2006, as special athletes gathered from all over southwestern Oklahoma to participate in the Great Plains Area Special Olympics at the Lawton High School track. As always, members of the Lawton NE Lions Club were right there with them! The Oklahoma Lions Mobile Health Screening unit was on-hand. All of the coaches wore shirts with our club name and logo on the back! It was great to see District 3-L Governor Al Sikora, BeLinda Gwoompi from the Walters Lions Club, members of the Walters Leo's Club, Amanda Bousley (wife of Lion Jay Bousely), and all of the other Lawton NE Lions that showed up to help! A big "Thank You" goes out to Vice District Governor Ed "Conan" Rall; Lion (Sergeant Major) John Henry; Capt. Jacqueline Glaze and her outstanding Soldiers from D Detachment, 15th Finance Battalion; the great Soldiers from all of the other Ft. Sill units; and Joy Chapman, Nikki Foxx, J-TYME and the rest of the wonderful staff from Perry Broadcasting. All of you were a very big help to the Special Olympics this year. That was a job well done Lions and friends!